Brewster: Not bad for a guy who didn't finish his first year of college, wouldn't you say? Angela: Oh, you're doing great, but I don't think you inherited me with your money, Mr. Brewster. Montgomery Brewster (Richard Pryor) is an aging minor league baseball player who still dreams of pitching in the big leagues. His team is small town, games are delayed to let the trains run through the outfield, yet somehow, he thinks he can make it. When Brewster notices a photographer in the bleachers, he figures it must be a talent scout, but when he and his team catcher, Spike Nolan (John Candy) are bailed out of jail for a bar fight and taken to Manhattan, Brewster is about to find out he has hit pay dirt—literally. He is informed by his late uncle's accounting firm that he stands to inherit 300 million dollars, but there is a catch: he has one month to spend 30 million dollars without acquiring any assets. If he can do so, the inheritance is his, but if he has so much as a penny left over, he forfeits everything. To make matters more complicated, he can't just give the money away, he has to get something of value in return, and he also can't tell anyone what he is up to. Brewster embarks on his task and manages to make his way through his first ten million, but those around him don't understand how he can be so frivolous with his money, and set out to try and help him. Buddy Spike brings in a financial advisor who makes some prudent investments, and when a string of bets placed on long odds pay off, Brewster is back where he started. With only a few weeks left to spend a fortune, the challenge may be too great to overcome, especially when one of his employees is hired to make sure he doesn't reach his goal. Warren Hill (48 Hours) helms the seventh film incarnation of George Barr McCutcheon's novel, the first dating back to a Cecille B. DeMille picture from 1914. While not Prior's strongest film, his performance here is pretty funny, aided by John Candy's formidable comic presence. The humor is wry, playing off the fish-out-of-water scenario, and the Brewster character's frustration with the difficulty in completing his task. Along for the ride are Lonette McKee, who adds the love interest as his personal accountant, and Stephen Collins as her conspiring lawyer fiancé-turned-interior-decorator. Cameos include Rick Moranis as a mimicking fortune seeker, Yakov Smirnoff as a chauffeur, and Hume Cronyn as Brewster's crotchety deceased uncle. Perhaps not a masterpiece, Brewster's Millions still holds up as a great time waster, providing a number of laughs, and feeding on everyone's dream of having millions at—and for—our disposal. Image Transfer Review: The 1.85:1 anamorphic transfer is pretty solid overall. The opening has a number of specs, but they aren't present throughout. Grain is fairly evident, but looks natural. Colors are vibrant in places, but muted elsewhere, and shadow detail is sometimes lost. The transfer isn't overly crisp, but looks about on par with similar productions from the mid-1980s. Audio Transfer Review: Stereo audio is clean and dialogue is easy to discern, without any excess sibilance. Frequency range is limited, with no deep bass present. The soundfield is primarily mono for dialogue, with foley and the musical backing filling out the image. The package indicates this is mono, but it is not. Extras Review: Extras include the theatrical trailer, notes on the production, and cast information for Richard Pryor, John Candy, Stephen Collins, Hume Cronyn and director Walter Hill. How would you blow 30 million dollars in a month, and have nothing to show for it in the end? 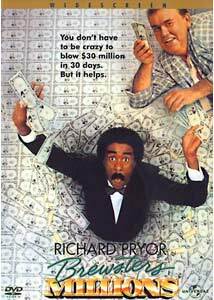 In Brewster's Millions, Richard Pryor and John Candy combine to bring a funny adventure where money is no object. The performances are even and the story will have you laughing all the way to the bank.